Voters who turn out for primary elections often are characterized as party extremists responsible for nominating candidates with ideologically extreme views. But a new analysis finds that these voters may not be much different from those who participate in general elections — although they do seem to be more interested in politics. Election reform advocates frequently argue that changing the primary process could reduce political polarization. The forthcoming study, from researchers at George Washington University and the University of California, Los Angeles, offers insights about the men and women who vote in primary elections — elections used to narrow a field of candidates or determine political party nominees prior to a general election. The scholars analyzed data from four elections — two presidential and two midterm elections held between 2008 and 2014 — and five surveys of the American public. They compared primary voters with general election voters and looked at whether primary voters differed from rank-and-file voters from their party, whether they were Democrats or Republicans. The results suggest that primary voters are similar in terms of demographics and policy positions to those who identify with their party or voted for its presidential candidate in the general election. Primary voters also are not very different from those who identify with their party and voted in the general election but skipped the primary. Primary voters reported being much more interested in politics. For example, 81 percent of Republican primary voters in the 2014 election said they were very interested in politics compared with 69 percent of Republicans who voted only in the general election that year. Primary voters were more likely to donate to campaigns. An example: Nearly half of the Democrats who voted in the 2012 primary reported donating to campaigns. Less than a third of Democrats who only voted in that year’s general election did. The National Conference of State Legislatures offers an explainer on the different types of primaries conducted in the U.S. 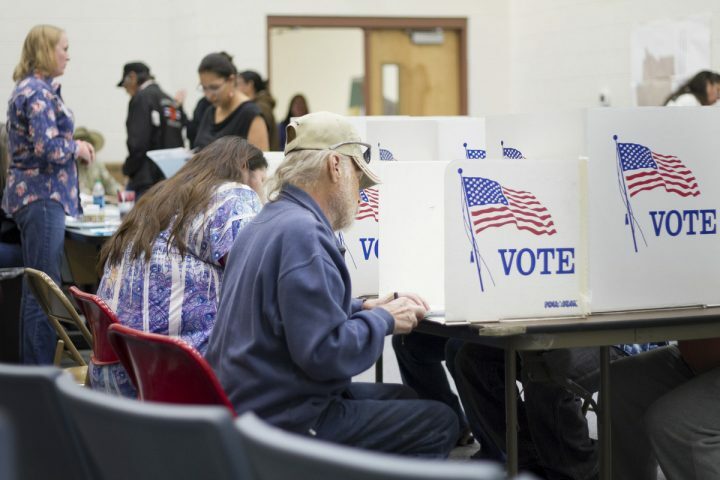 The Pew Research Center focuses on a range of issues, including voter turnout. A report released in June 2016 suggests primary turnout rose significantly in 2016 and that an estimated 28.5 percent of eligible voters participated. The U.S. Census Bureau also collects and distributes voter data, which shows that 61.4 percent of U.S. citizens who were at least 18 years old reported voting in the 2016 presidential election. If you’re looking for more research on primary elections, check out Journalist’s Resource’s other write-ups on voter participation in presidential primaries and political involvement during the 2016 election. This photo, obtained from WyoFile‘s Flickr group, is being used under a Creative Commons license. No changes were made. Citation: Sides, John; Tausanovitch, Chris; Vavreck, Lynn; Warshaw, Christopher. “On the Representativeness of Primary Electorates,” British Journal of Political Science, forthcoming 2018. DOI: 10.1017/S000712341700062X.